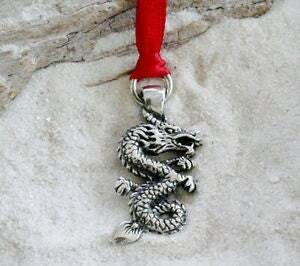 This dainty Chinese Dragon Ornament is handcast and hand-finished in solid American Pewter with a shiny finish resembling antiqued sterling silver.This unique Holiday Ornament comes with a Red Satin Ribbon ready to hang from your Christmas Tree or as a Holiday Decoration for your home. They also make terrific gifts...you and your loved ones can enjoy this lovely keepsake for years to come! The Chinese dragon is a Chinese mythical creature depicted as a long, scaled, snake-like creature with four claws. In contrast to the Western Dragon, which stands on four legs and which is usually portrayed as evil, Chinese dragons have long been a potent symbol of auspicious power in Chinese Folklore and art. The Chinese dragon is traditionally also the embodiment of the concept of Yang (male) and associated with the weather as the bringer of rain and water in an agriculturally water-driven nation.